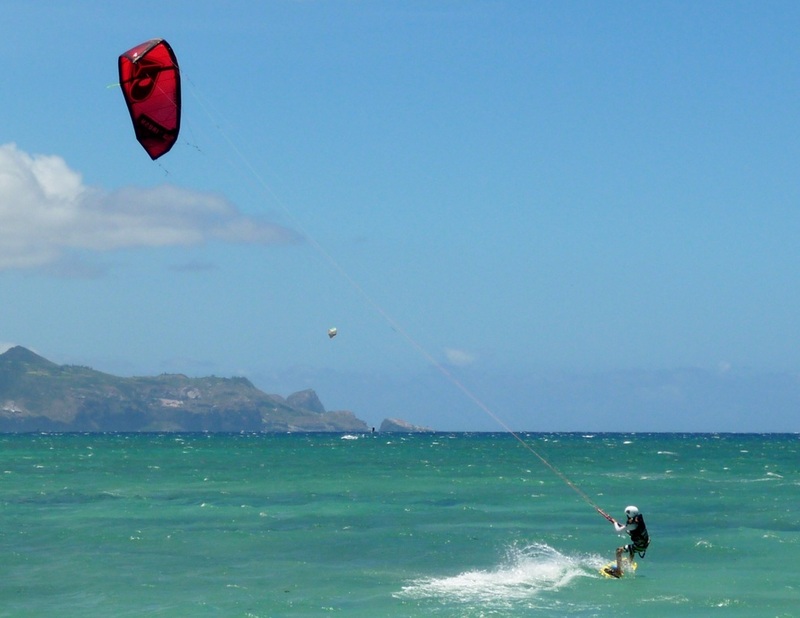 Why should I choose Complete Kite Boarding? We are going to have fun as you learn one of the most exciting sports. With 18 years of practical knowledge and 15 years of teaching experience, I can teach you to excel quickly. You will learn things that other instructors or schools just don't know. You cannot find this information it in a book, video or magazine You will need this information because the wind and the waves can quickly separate the competent from incompetent. Eventually you will find yourself in a situation where you will need to know what to do. Never learning what to do or worse yet being taught incorrectly can make you difficult to rescue. You are important and are worth being taught by of a skilled professional. 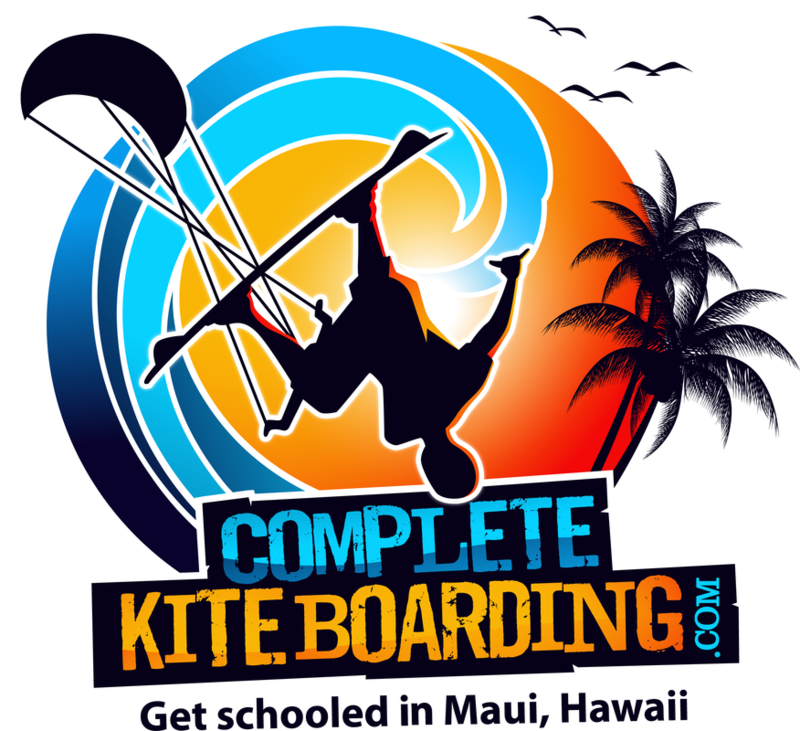 At Complete Kite Boarding you learn from a knowledgeable, patient, safety conscious kite board instructor with over a decade of service who wants you to reach your goals in the most direct path possible. Going to another school is just a waste of your time and money. Can anyone learn to kite board? If you can ride a bike, then you can probably learn to kite. Learning to kite board is easy if you are at a good location with a good instructor. Many people have wanted to kite for a long time before they take a lesson. Take the next step and say "I'm going to do this." To book a lesson, call (808)250-6922. Kite boarding is not learned in one day. The average person will require at least 9 hours of instruction to cover most fundamentals. These hours can be done in a few days of even spread out over years. Throughout the world you will find that most schools offer a "9 hour package special" in the hopes that a person will take advantage of the opportunity to approach the sport safely. Often people will take 9 hours of lessons and then continue to practice what they learned with a friend. Lesson are $110/hr plus tax. A single person can book a 9 hour package and receive 10% off, plus tax. Two or more people can share a class and each person will get 25% off, plus tax ($82.50/person per hour + tax). Kama'aina, active military, children under 12 and senior citizens with ID automatically receive 10% off. Do I need to take lessons on consecutive days? No, you don't need to take all of your lessons consecutively. I've found people tend to do well or even better with time off between lessons. Some people take one lesson a year. No, you don't need to be strong. You will be seated in a harness. Think of para-sailing; your arms are not holding you up. You have a harness to support you. The same applies to kite boarding. Have you taken lessons from another school? We can pick up where you left off. Or I help you with things that don't seem to be working for you such as: safely launching, safely landing, re-launching from land, re-launching from water, body-surfing with the board, body-surfing upwind, right of way, effortless water starts, correct posture, going upwind, slowing down, changing directions or self rescue. To help you get the most of your time, you can bring a list of questions to the lesson and I can focus on exactly what you want to know. Yes and No. Yes, there are ways to learn to kite board more quickly. Some preparations are listed at the bottom of the page. No, I don't recommend you teach yourself or have your friend who kites teach you. I've had many students who first took lessons from a friend and they learned just enough to be a danger to themselves and others. Often your friend will give you inaccurate advice that will put you at risk and may destroy your gear. You want to take lessons to avoid hurting yourself and will find that destroying gear is very expensive. Many of the things you would most naturally do are the same things that will get you injured. Go to a competent instructor who will teach you how to kite board correctly. More importantly, learn from a teacher who will show you how to recognize a problem and how to respond effectively in a timely manner, before things go wrong. Yes, gear will be provided. Our goal is to set you up in the correct gear to help you succeed. Ideally, you have just long enough lines and a kite with just enough power for you to accomplish a skill. We want to minimize any potential risk. For example, we wouldn't want to connect you to a 7, 10 or 12 meter kite that is large enough to lift you, when we are just learning to turn a kite. We only need a small kite that will not endanger you while you are learning the basics. Can we communicate while I am in the water? While you are in the water, I use 2-way radios to guide you through every step. I teach how to do a step on land and then apply that skill in the water. You will know what you are doing and how to do it prior to entering the water. The radio is used to fine tune your technique in real time. At Complete Kite Boarding I will be your instructor. 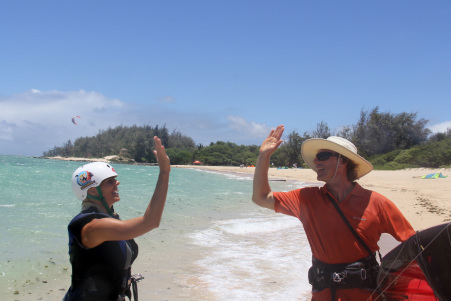 You do not have to be worried that you will be paired with an instructor whom just learned to kite and was hired on the beach a few weeks ago. If you do choose another school, I would recommend asking for an instructor that has at least 4 years of experience. Here is my rationale: unlike Maui, most places in the world have a kite boarding season that is 2 or 3 months long and If they teach for four years that just may be the equivalent of working their job for 12 months. With a years worth of experience they may have an idea of what to do when things go wrong and may be able to answer your questions correctly. If you have a chance, watch instructors from many schools teach and request the one whose students are progressing quickly and know what they are doing. Should you see an instructor with a student doing nothing more than sitting on the beach, avoid them as you will learn little practical value. 1) Water. We'll be in the hot sun and last night's Mai Tais and this morning's coffee may have left you dehydrated. 2) Sunscreen. Zinc oxide works. Don't forget to apply sunscreen to your feet. 3) Polarized Sun Glasses. The sun's rays bounce off of the sand and water and can damage your eyes. 4) Hat with a Strap. Your old baseball cap will not block out much sun after the wind blows it off of your head. 5) Healthy Snack. After a couple of hours your sugar level will drop and so will your fine motor skills and ability to focus. 1. By far and away the best way to save money on kite boarding lessons is to develop great kite flying skills ahead of time. Buy a small or medium two line stunt kite and a chair without arm rests. Find a place with steady wind and fly your kite as often as you can. When kite flying becomes a relaxing activity, then buy a 4 line stunt kite to further your kite flying skills. 2. If you have never ridden a board in your life, buy a skateboard and ride back and forth holding onto a friend's hand or a hand rail. It is important to be comfortable traveling with your left foot in front as well as with your right foot in front. 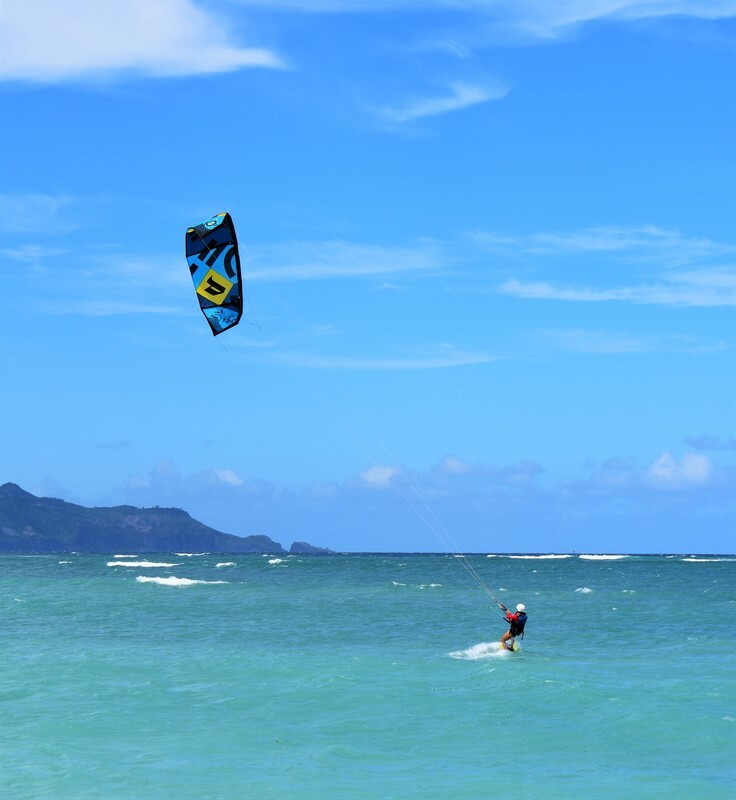 When you are kite boarding, you will be riding "regular foot" going one direction and "goofy foot" traveling the opposite direction. If you snowboard, practice riding with your less dominate foot in the back. 3. Although kiters rarely swim, you should at least know how to swim the back stroke. You will find it an easy stroke to do with a life jacket on. 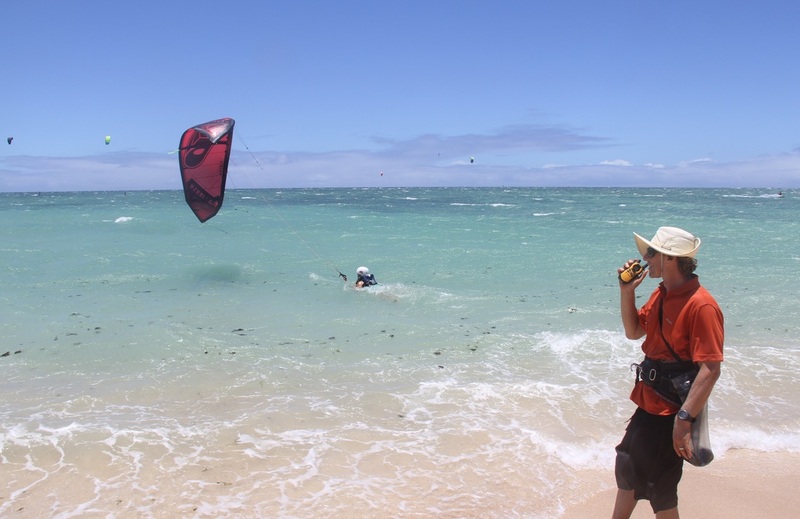 During the rare times that you would swim while kiting, it is using a back stroke to swim away from your kite to regain tension in your lines. For the most part, swimming is a last resort. Since we have an engine, the kite, we prefer using this power source to bring us back to the beach. 4. Now that you can fly a 2-line kite and ride a skateboard, combine the two. See if you can fly a kite while balencing on a balance training ball. I have been teaching people of all ages and skill levels to kite board since 2003. Whether you are a nervous and timid beginner, a comfortable intermediate kiter or are looking to master professional tricks, we can set up a lesson for you. 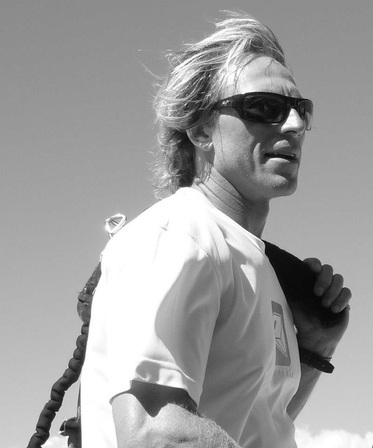 I can show you how to align you kite, board, bar, body and hands to succeed kite boarding. Also, I can show you the common mistakes of every step that are making learning to kite difficult for you. Are you concerned about safety? I'm the only school on Maui that uses a 5th line dedicated for safety. When you are on a 4-line kite, you are using a power-line that doubles as your safety-line. If and when your safety jams or fails, you will find out why they are called "power-lines." On a 5-line kite, activating your trim loop quick release or simply pulling on the 5th line will de-power your kite. Looking to buy a kite, bar or board? Email me at kiteboardmaui@gmail.com and I'll see if I can get you the best price. 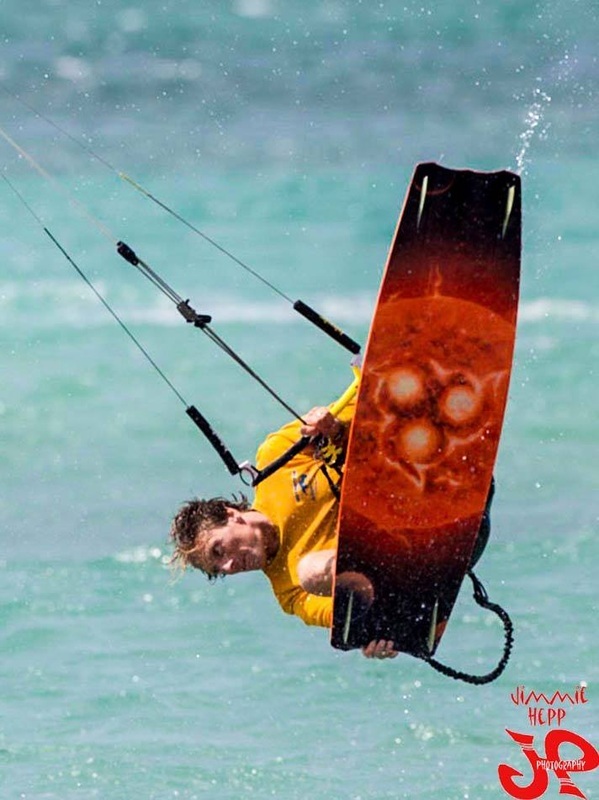 Former Complete Kite boarding student Tomas is now the U-18 Brides of the Gods Champion! Things to do on Maui? 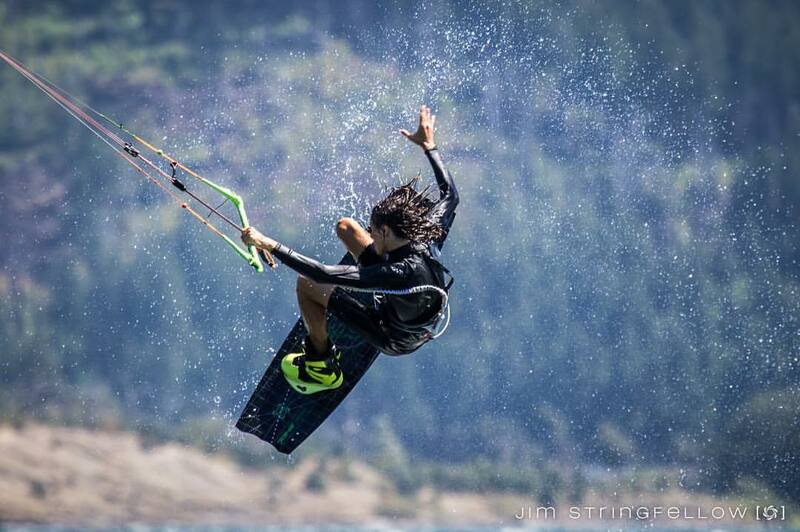 Learn to kiteboard like Tomas did. 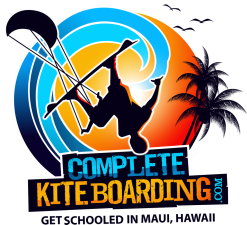 Maui kite boarding lessons with step by step instruction. Daniel kite boarding towards shore at Kanaha Parki, Maui. 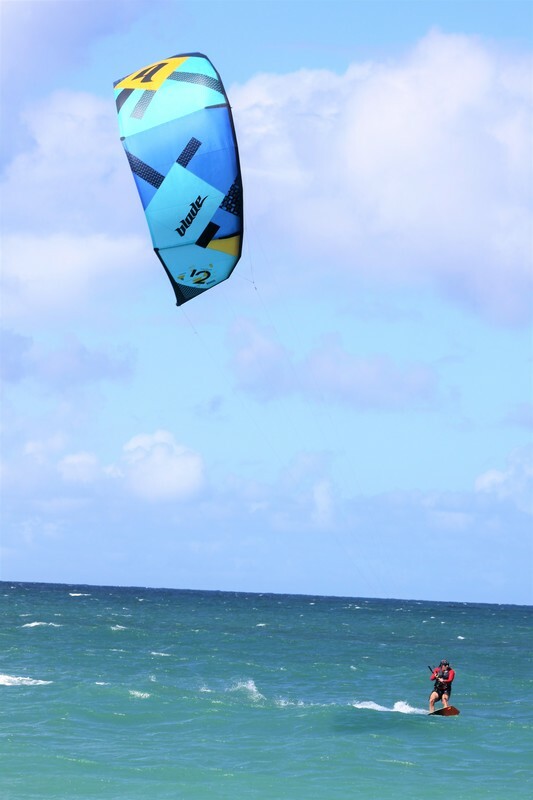 Maui, Complete Kite Boarding School Ben L.
Kite boarding can become a beautiful part of your life and bring you so many good times. I think you'll find it is important for you to go to the beach, to be around other people living life, to feel the sun warm your skin, to connect your feet to the sand and feel the how the water releases tension. You'll find that when you are kiting, you are the connection point between two forces of nature, the wind and the water. It is awesome to be in harmony with the elements. 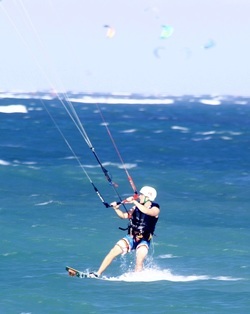 You control your speed and direction by leveraging against the wind and water using your board and your kite. Since you are using a harness to do the work for you, it requires very little strength to connect these forces of nature. In time you could be spending the afternoon sailing in a tropical bay. Maybe you have dreamed of carving the most beautiful turns under a sunset. Some people want to jump high, soar and then float softly down--this is addicting. Many people, myself included, just want to kite-surf waves all day. A few people want to cross the ocean. I don't know where you want to go on your kite boarding journey but I can say the journey is worth your time. First off, don't give yourself an excuse not to have fun. 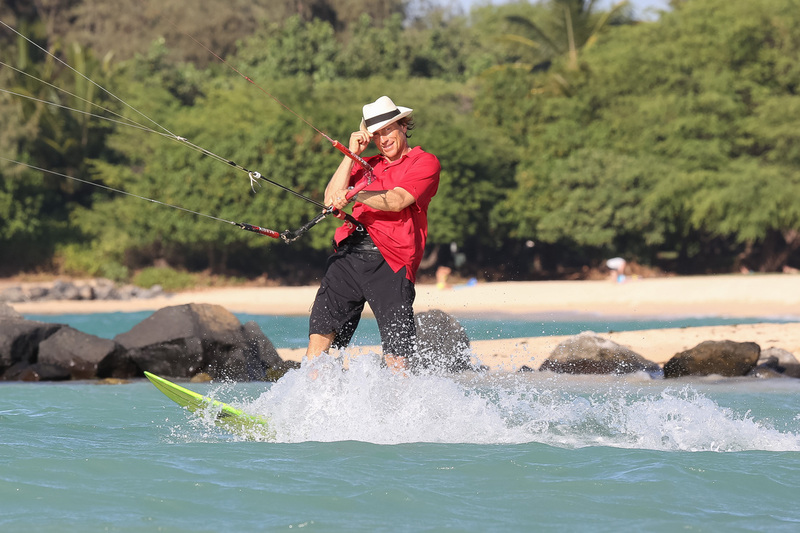 Kite boarding is a sport for the old, young and everyone in between, including you. Some people mistakenly think that it is a strong person's sport. It is not. In all honesty, it is a lazy person's sport. For the most part, you are resting half of your body at a time while leveraging your weight against the pull of the kite by leaning back in your harness. Your arms are relaxed and will lightly pull the bar a little to the right when you want the kite to move towards its right side. Lightly pull to the left if you want the kite to move to the left side. When you are not sure what to do, just let go of the bar and sit down. In my experience, people who can be lazy and do nothing will have an easy time learning to kite board. If you are a control freak or a muscular person, you can still learn to kite; just allow yourself more time. Remember, e-mail me at kiteboardmaui@gmail.com and let me see if I can get you the best price on Kite gear!